Market forces in health care are paradoxically pulling physicians and hospitals apart and together at the same time. What are these forces and trends? Is the long-standing marriage of interdependence and productivity between them destined to fail, or can it be saved and even strengthened by emerging delivery and governance models in the so-called "market revolution" of consumer-driven health care? What are the implications for health care policy and practice? 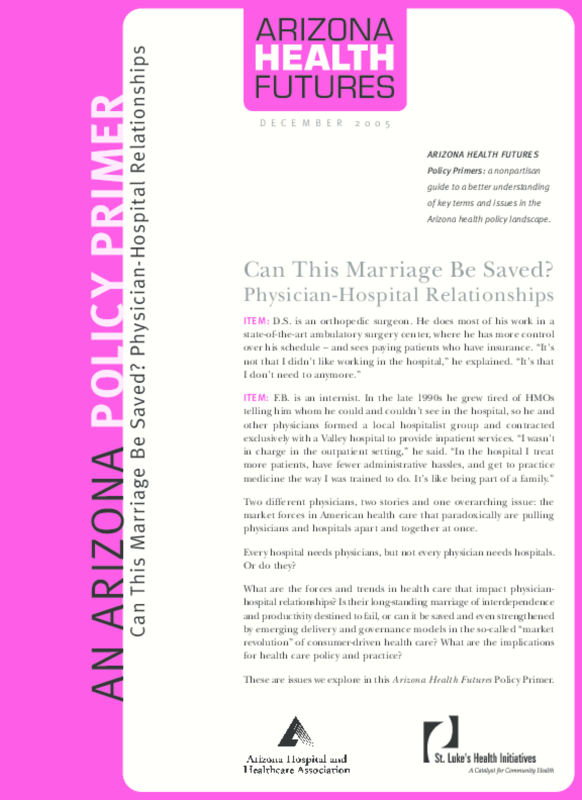 These are issues we explore in this Arizona Health Futures Policy Primer. Copyright 2005 All Rights Reserved. Material may be reproduced without permission when proper acknowledgment is made.